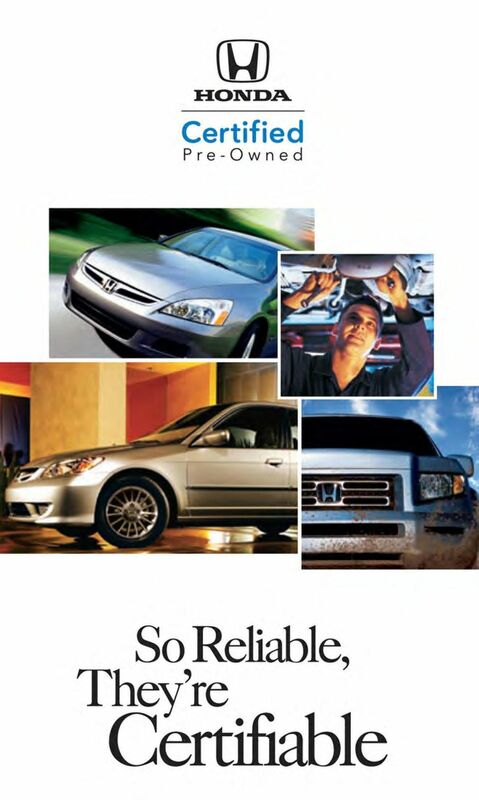 5 Key provisions: Powertrain Systems and Components Coverage: Up to 7 years or 100,000 miles from the date the vehicle was fırst registered under the Honda New Car. 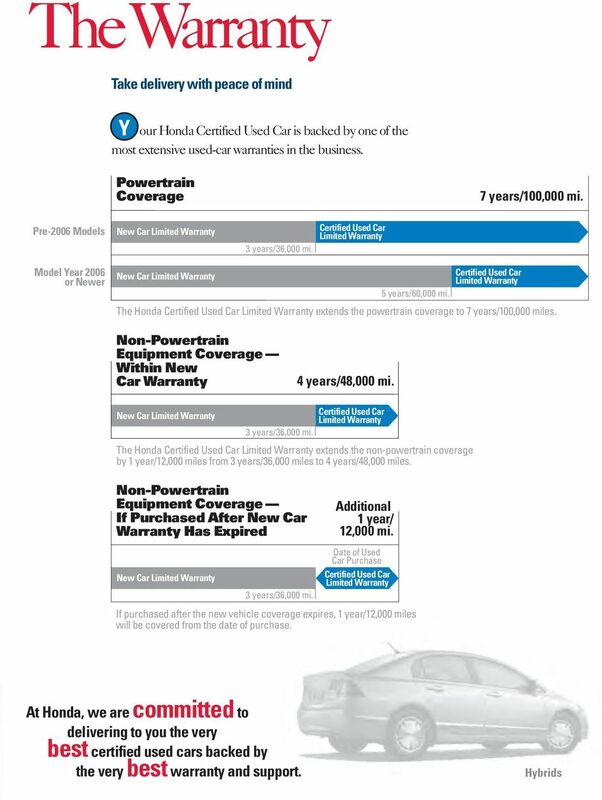 Non-Powertrain Systems and Components Coverage: For 12 months or 12,000 miles beyond the expiration date of the standard new-car warranty (except normal wear and tear, paint and upholstery). 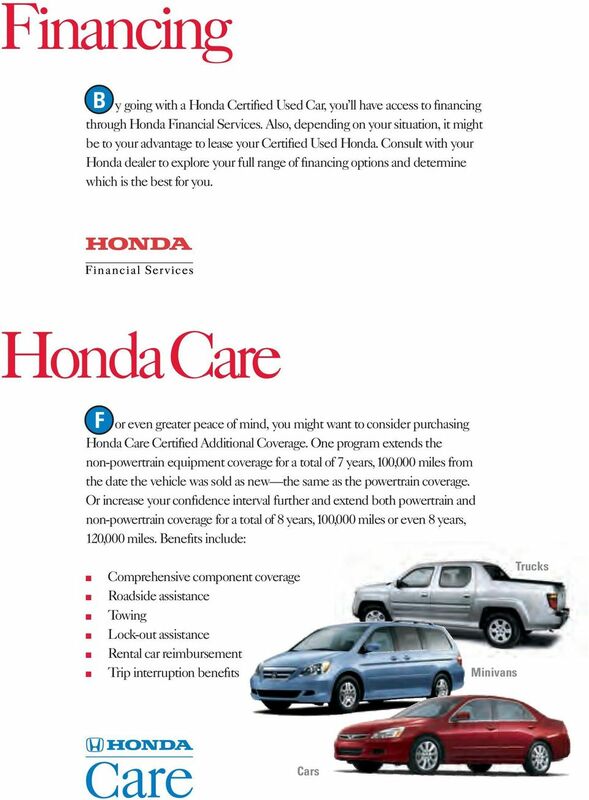 Deductible: No deductible on covered repairs made at any Honda dealer nationwide. Transferable: Yes, between private parties. 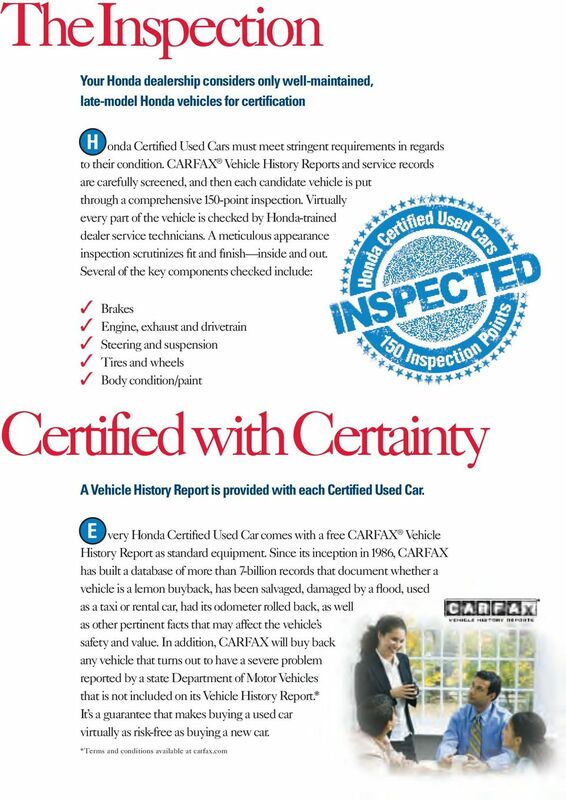 For complete details, ask your Honda dealer to review the Honda Certifıed Used Cars Warranty with you. 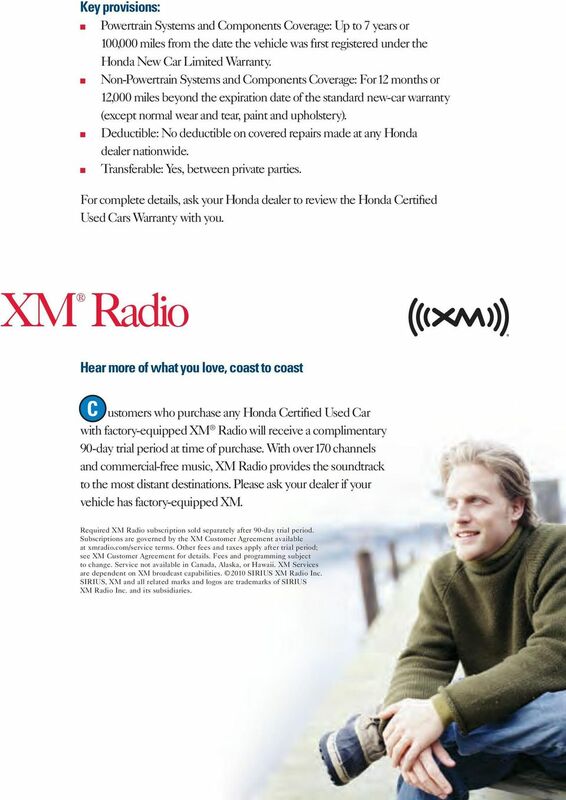 XM Radio Hear more of what you love, coast to coast C ustomers who purchase any Honda Certifıed Used Car with factory-equipped XM Radio will receive a complimentary 90-day trial period at time of purchase. With over 170 channels and commercial-free music, XM Radio provides the soundtrack to the most distant destinations. Please ask your dealer if your vehicle has factory-equipped XM. Required XM Radio subscription sold separately after 90-day trial period. Subscriptions are governed by the XM Customer Agreement available at xmradio.com/service terms. Other fees and taxes apply after trial period; see XM Customer Agreement for details. Fees and programming subject to change. Service not available in Canada, Alaska, or Hawaii. XM Services are dependent on XM broadcast capabilities SIRIUS XM Radio Inc. SIRIUS, XM and all related marks and logos are trademarks of SIRIUS XM Radio Inc. and its subsidiaries. 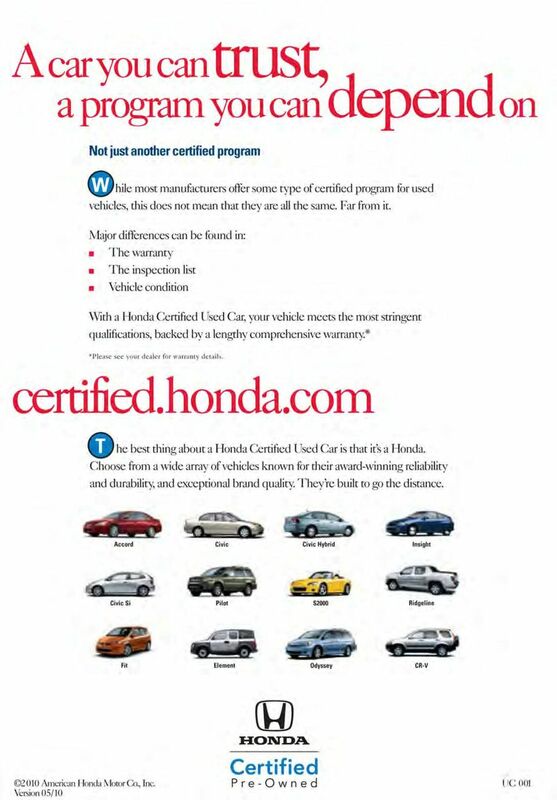 so your teen wants a car?